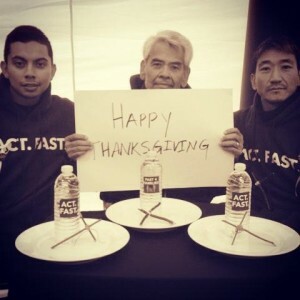 While many gathered for Thanksgiving and were lucky enough to have an abundance — some would even say an overabundance — a group of activists did not pause from their fast to enough the festivities. In fact, on Thanksgiving they had what they’ve had for the last three weeks: A GLASS OF WATER. That’s it. Nothing more. The activists are camped out within sight of the U.S. Capitol and they say they’re going to continue to fast until Congress votes on immigration legislation. The president and first lady went by the encampment to show their support for a vote and to ask the Republican majority in the U.S. House to hold a vote once and for all. What has the GOP leadership said so far? Not much. And that’s why the activists are still there.